Now that we've had a weekend to recoup from the bright lights and pulsing music of the world's most elaborate video game marketing circus, it's time to take a quiet moment to reflect on the games we didn't get to play at E3 2013. Jade, Samus, Drake — where were you guys? As Ubisoft slowly unveiled it's next-gen open-world MMO shooter The Division, I was almost positive it was either Beyond Good & Evil 2 or perhaps one other game. Alas, no pig men, no Jade. Hearts broken, yet again. You guys said next-gen consoles! Here they are! One of the best-selling games in Japan of 2012 and a title with the potential to sell Wii U consoles to a ton of folks who wouldn't give a damn otherwise. Sure, elderly Japanese ladies might hate it, but some of us love the idea of the massively multiplayer installment of the classic role-playing series making its way stateside. Sure, it'd be a logistical nightmare in the West, but it'd be our logistical nightmare. Or Nintendo's. Just give us the game, dammit. After Sony quashed pre-show speculation that Team Ico's eagerly anticipated third title would be seen at E3, we weren't really expecting anything of The Last Guardian this year, aside from more eager anticipation. What we did get was that development of the game was on hiatus — oh wait, no it isn't. Stop playing with our hearts, Sony. Technically a new Super Smash Bros. is a small fraction of a Metroid game, but we were hoping for more of a starring role for Samus Aran, space bounty hunter. Metroid Prime developer Retro Studios opted to spend its time doing the old Donkey Kong, but rest assured it has big plans for the future of the franchise. Already released in Japan on the PC and Vita, with iOS and Android ports on the way, the latest Phantasy Star Online game is living up to that adjective as far as the Western world is concerned. Once scheduled for early 2013, the game's North American release was delayed earlier this year, with no ETA. An E3 appearance would have made fans feel better about the wait. Here's my theory: Professor Layton's two latest games, both already released in Japan, were at E3 2013 the whole time. They were scattered about Nintendo's booth in riddle form, with some aspects of the puzzle only appearing at Best Buy stores around the country. Both the final game in the series and the crossover with the second-smartest franchise to grace a Nintendo handheld were hidden in plain sight, and we were all to blind to see them. That's the only reason I can imagine we did not see them at the show. As Ubisoft slowly unveiled it's next-gen open-world MMO shooter The Division, I was almost positive it was either Rainbow 6: Patriots or perhaps one other game. Instead we got an entirely different sort of Tom Clancy game. The domestic terrorism simulator isn't completely gone, despite losing some of its top talent last year. Ubisoft confirmed during the show last week that Patriots — originally for the Xbox 360, PlayStation 3 and PC — was now in development for next-generation consoles. Announced earlier this year to the ridiculous cheers of the role-playing fans on Kotaku's staff, not much has been said or seen about the game that combines the delightfully twisted taste of Shin Megami Tensei with the more traditional fantasy role-playing tactics flavor of Nintendo's Fire Emblem series. Perhaps Nintendo felt it was enough for fans to know the project was out there. It is, but some screenshots or something would have been nice. Yes, yes Naughty Dog — you just released one of the biggest, most well-received games of the year, a title some might even consider one of the best of all time. That's lovely. Now stop slacking off and bring us more Uncharted. There's a brand-new console coming, and we were really expecting you guys to show off what you could do with the power of the PlayStation 4. Instead, you wasted all of your E3 time showing off a game everybody was already going to buy anyway. How about an Uncharted 4 with old Drake played by Nolan North and his scrappy son played by Troy Baker? Give them a talking dog sidekick played by John DiMaggio and you've raised the bar once more. 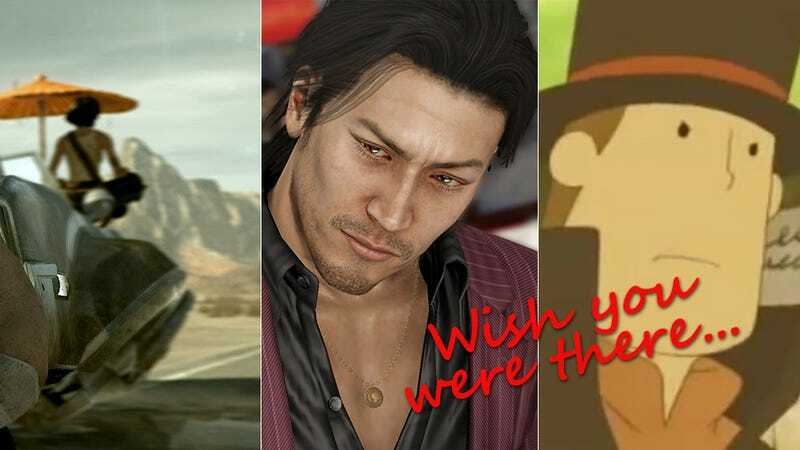 We were almost positive Sega would say something about the fifth entry in the Yakuza series coming West during E3 2013. There were pre-show murmurs. The creator of the series was in attendance. There was a haiku, dammit. We're pretty sure this one is still coming, and Sega is just being coy. There were many disappointing omissions at this year's show, but look on the bright side — every non-appearance makes the anticipation that much sweeter. What games were you looking forward to at E3 2013 that didn't make it to the show floor?